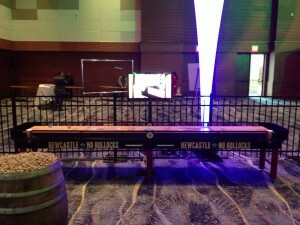 Table Shuffleboard is gaining popularity across the UK. It’s time you gave it a try too. But, before you buy one, why don’t you learn how to play the game first. There are a variety of ways to play shuffleboard, but the basic game has two players competing to slide their pucks (or “weights”) into scoring zones on the table to earn points for that particular round or “frame”. Multiple frames make a match, and whoever gets to 15 points first is the winner of the game. First, you need to understand the layout of the shuffleboard table. Traditionally, tables have a layout of three scoring zones on the playing surface; these are conveniently numbered 1-2-3, with the third zone being the closest to the end of the table furthest from the shooters. Around the perimeter of the table’s playing surface is the area known as the“gutter”, much like in bowling. When pucks fall into the gutter, they are considered out of play for that frame. When players slide (or “shuffle”) their pucks across the length of the table, there are a few lines they must keep in mind. First, when it is a player’s turn, he or she must stand behind their end of the table keeping one foot behind the table and the other foot behind the “deuce” or “2” line. Second, the line that begins score zone 1 (the line closest to the player) is also known as the foul line. Most people have the misconception that this line is the foul line furthest away from the shooter which is not the case. If a puck does not cross that line completely (that is, the puck still touches any part of the line when at rest), then the shot is considered a “foul” and must be taken out of play and the next player continues with their turn. The final line to consider is the farthest edge of scoring zone 3. If any part of the puck goes over this edge, but the puck remains on the table, then the puck is called a “hanger” and is worth 4 points. The object of each frame is to have one’s puck closest to the far edge of the table and remaining on the playing surface. The player with the furthest puck is the only one who collects points for that frame. Any one of his or her pucks that are located between the furthest puck and the opponent’s closest puck is also awarded points according to the value of that particular weight on the board. Only one person scores points per frame. 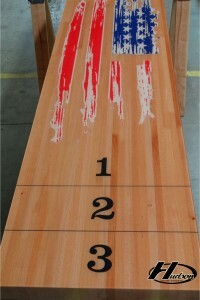 On traditional boards numbered 1-2-3, points are awarded based on the location of the weight. The amount of points each puck earns is determined by whether or not it has completely passed the line of the next zone. For example, if the winning puck is touching the line that marks the beginning of zone 3, it is considered to actually lie in zone 2 because it did not completely pass the zone 3 line. If a weight is in doubt of completed crossing over a line, it is measured by leaning directly over that weight and making sure you see the color of the wood on the plank between the scoring line and the weight. When doing this, be sure not to touch any part of the cradle. In the event that there is no leading puck due to a tie or because all pucks ended up in the gutter, no points are awarded and that frame is over. Regardless of where the other pucks lie, if it has been determined there is no leading puck, no points are awarded and the “hammer” switches, meaning the player that went last in the frame resulting in no points awarded shoots first in the following frame. The most common game of shuffleboard played is called “Knock Off”. This is where each player has 4 weights and shots are alternated until 8 weights are thrown. To start a game, a coin toss is done to see which player goes first and who gets the “hammer” that is the final shot of the frame (the most important shot). The winner of the coin toss gets the hammer while the loser gets their choice of color for their weights, which is typically an option of red or blue. Each player has 4 pucks and takes turns using either hand to shoot their pucks into a scoring zone either knocking their opponent’s pucks off the table, protecting and blocking their current pucks on the board, or out-lagging their opponent’s weights. Players are not allowed to touch the playing surface with either their playing hand or their free hand. However, they are allowed to hold onto the frame of the table with their free hand, and the playing hand can slide fingers against the edge of the playing surface when making a shot along the edge of the table. The most common shot using the rail of the playing surface as a guide is called a “cross” or a “jersey shot”. Other shots that involve use of the rail as a guide are called the “mini span”, “span”, or “rail shot”. A shot without use of the rail as a guide is called a “free hand” shot. This is the most popular shot for novice players but is actually considered one of the most difficult shots in the game. A game of shuffleboard is typically played to 15 points and occasionally to 21 points. You do not need to win by 2 points. Shuffleboard is a game of strategy that combines offensive and defensive tactics. Advanced players will wait for the opponents to expose their weaknesses or capitalize on their mistakes. Mistakes can include leaving a weight too short providing the other player the chance to go around or wrap that weight, or leaving their last weight too deep on the board giving the player with the hammer to use this weight as a backboard to drive and stick their last weight into. At the end of a frame, the winning puck is determined and that player is awarded points for the leading puck and additional pucks that are ahead of the opponent’s puck furthest towards the end of the board. For the next frame, the player that scored points from the previous frame goes first from the opposite end of the shuffleboard table. If no points were earned in the previous frame, players alternate between who goes first and who gets the hammer shot for the next frame. The player who gets to 15 points first is the winner of the game. And those are table shuffleboard’s basic rules. Try the game sometime. You might really, really like it. Please feel free to ask any questions. 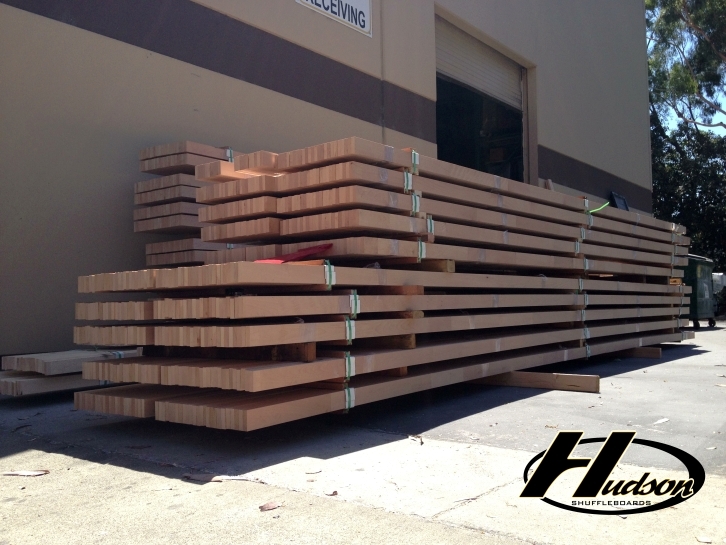 From the playing surface to the seal and finish, Hudson Shuffleboards builds a better board. Check out the features and attributes and you’ll quickly be convinced. We’ll start with the shuffleboard’s primary element, the playing surface. The playing surface on a Hudson Shuffleboard is constructed with rock-hard maple, which is hand selected. It is glued and milled in-house and never outsourced. All planks are finger-jointed lengthwise, a characteristic found only with Hudson Shuffleboards. The playing surface on our Berkeley, Grand Deluxe, Intimidator, Cirrus, Commercial, Ponderosa, Torino Limited, and Dominator lines is further strengthened by inlaying pieces of maple on the bottom of the board. This also provides more support to the joints. These inlays run perpendicular to the length of the table and are also strategically located at the ends of the table and at the location of the climatic adjusters. While the table construction is a differentiation for Hudson, the sealing process for the table is equally as important. A proper seal ensures that the wood’s moisture content remains constant. What happens if the wood isn’t sealed properly? Failing to seal it or seal it with an inferior product results in the board warping or twisting, making it difficult or impossible for play. “The sides and bottom of our tables are sealed using a product specially developed for this use,” Hudson adds. “The polymer poured on the top acts as a sealer in itself. Our polymer is by far the clearest and smoothest on the market. 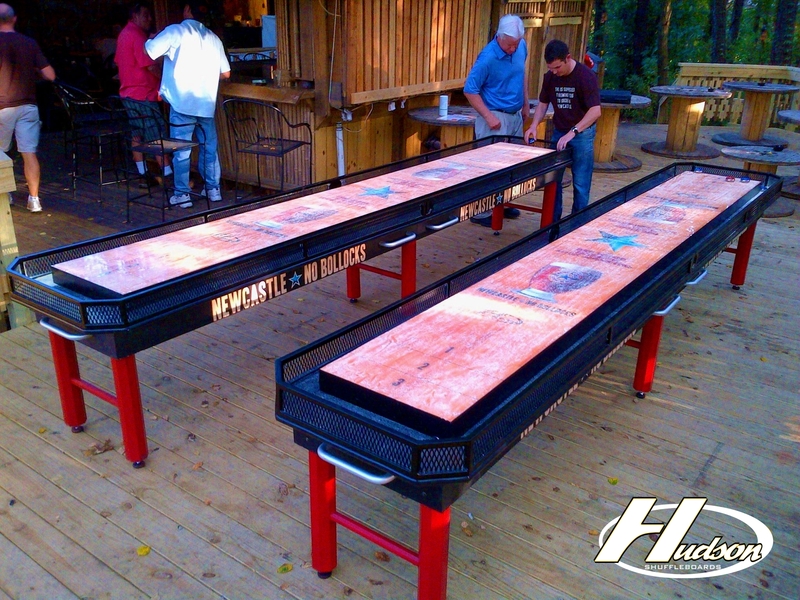 This gives our tables their trademark playability, which is preferred by the top players in the game.” Hudson Shuffleboards were the preferred table of choice at all major shuffleboard tournaments and unanimously voted the #1 board by professional players in the state of Texas. Never use green or wood that isn’t dry. Frequently you’ll see boards with a yellowish appearance or small ripples in the finish. This is the result of wood that is not ready to use. Finish playing surface edges with a “true” 90-degree edge. Why? This process gives you full use of a 20-inch wide surface. Other boards feature a beveled edge for the sides and corners, making it nearly impossible to hang a weight on the edge. Pours the epoxy finish with climatic adjusters attached to the table. Climatic adjusters ensure that the table is level lengthwise and adjusted to the proper specifications width-wise. Once this is done, the adjusters are gauged within a .001” accuracy and shipped ready to play. Now that we’ve provided Shuffleboard Manufacturing 101, you can understand why the Hudson craftsmanship is tops in the industry.